Are you tired of the video slot game machines today? Do you wish you had that classic game experience of being at a real Vegas Casino? You are not alone. The Twin Spin Slot Machine from NetEnt takes the best of two worlds together taking old school casino slots and patching it onto the latest five-reel video slot game theme. The game is a welcome relief from the complicated mind bending video slot games featured today and provides players with exciting double, triple, and much more chances to win big time. Apart from that, you have 243 bet ways to ensure that you get the maximum possible earnings compared to all the other slot games out there. The overall ambience of the game is pretty much inspired from the classic casino theme adding in elements of modern space graphics to give you that contemporary feel. Twin Spin Slot Machine has a dark blue background with blue, magenta, and green highlights. You have yellow dots twinkling behind the reels. They add to the excitement of playing the game as they blink in coordination with racing light patterns as you are on a winning spin. The high tempo music enhances your excitement while you play. Twin Spin Slot Machine uses classic symbols taken directly from the original physical Vegas casino including A, J, Q, K, 9, and 10 from the card deck. The Vegas reel feel continues to be seen in the high value symbols as well with the pair of red cherries, the golden bell, golden bars, and the number seven in red. Staying with old school tradition, the highest value is assigned to the ultimate bling symbol, a huge diamond. The 80s club-disco music running in the background takes you back to the good old times while you play. Of course, you can switch it off if it seems to be distracting you. The game has an overall smooth playing interface. The wheels whir away effortlessly and silently so that your ears are not burdened with too much noise. The user control configuration from NetENT is featured here. The buttons are labeled clearly in green and white offset by a black display. You won’t have any trouble keeping in track of your present bet, coin value, coins in hand, and bet level. Overall, the game provides players with a hassle free playing experience, which few other video slot games can provide to you. The Twin Spin Slot Machine is designed on a simple interface so that you get the unadulterated thrill of playing the game instead of being distracted by unnecessary bells and whistles. 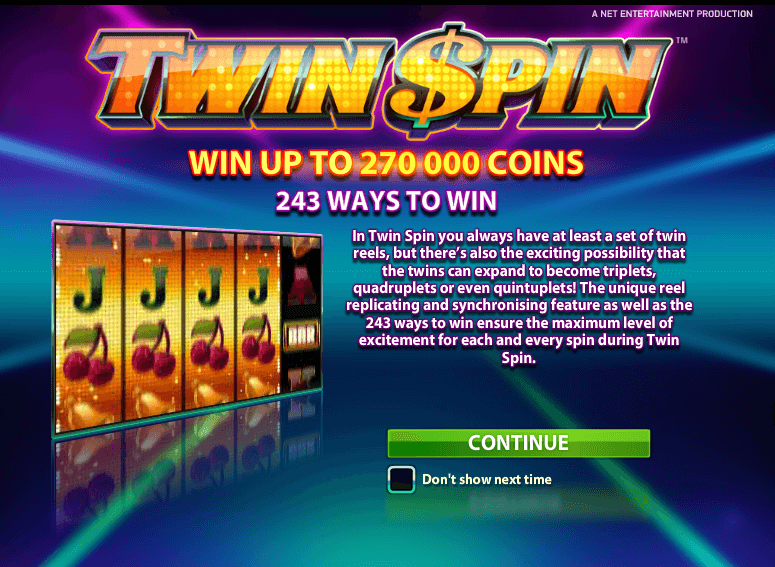 Twin Spin stands out from the other video slot games through its exciting reel synchronizing feature. You will not find the Scatter symbol, free spins, or separate bonus games; however, you have the option of making use of Autoplay which takes ten to thousand spins in your name. The game is highly preferred by veterans of the slots due to its simplicity and no nonsense interface. 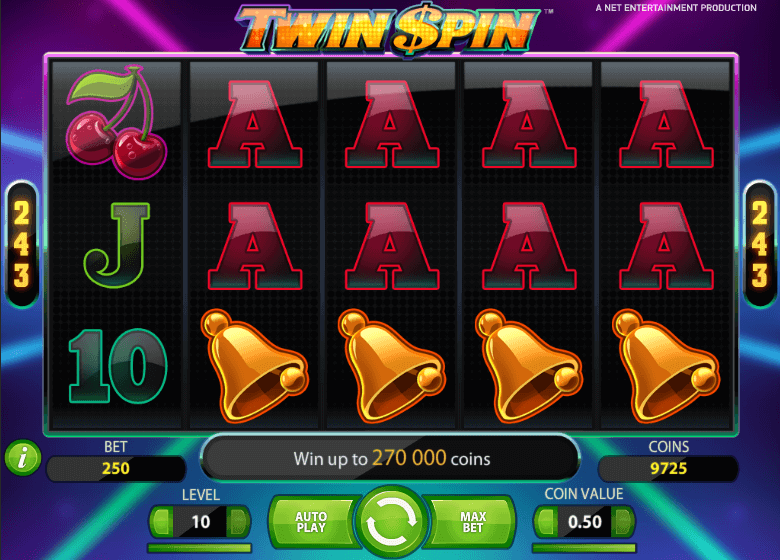 Twin Spin offers you ten bet levels with coin values in .01, .02, .05, .10, .20, and .50. You can bet a maximum of 0.25 on an individual spin with a maximum bet of 125. This works in favor of players who work with high limits. The coin jackpot comes to 270,000 coins. Twin Spin Slot Machine takes you back to the good old times where the game was focused on the true spirit of the game and the excitement of the spinning reels. Unlike other video slot games, you don’t have unnecessary features to cramp your style, keeping the game simple and clean. Twin Spin game gives you the old school feel of playing in an actual Vegas casino. The game is compatible with all major operation systems such as Windows, Linux, and Mac. Since the game is browser based, you have no complicated downloads to perform. The game is available on all major game portals. However, for the real time excitement of playing with real money, you need to head to Vegas Paradise and Jackpot Paradise. The prime attraction of playing Twin Spin Slot Machine on Vegas Paradise is that the portal offers a $200 bonus apart from a hundred free spins. On the other hand, Jackpot Paradise provides you with a $200 welcome package plus additional 100 free spins.